Briefly, in accordance with one embodiment of the invention, a wireless communication system may adaptively switch between a multiple input, multiple output mode and a spatial division, multiple access mode based at least in part on channel conditions and traffic conditions. The present application claims the benefit of U.S. provisional application Serial No. 60/493,937, filed August 8, 2003, entitled "A HIGH-THROUGHPUT WIRELESS NETWORK ARCHITECTURE, APPARATUS AND ASSOCIATED METHODS". In a wireless communication network, multiple antennas may be utilized at a transceiver in two possible ways: using a point-to-point communication system or using a point-to-multipoint communication system. A point-to-point communication system may be utilized to communicate with a single receiver to obtain higher signal quality and to provide a higher spectral efficiency. A point-to-multipoint communication system may be utilized to communicate with multiple receivers to obtain a higher signal quality and data throughput for each receiver. In such a multiple antenna wireless communication network, a point-to-point communication system may be a multiple input, multiple output (MIMO) system, and a point-to-multipoint communication system may be a spatial division, multiple access (SDMA) system. FIG. 4 is a flow diagram of a method to adaptively switch between a point- to-point link and a point-to-multipoint link in accordance with an embodiment of the present invention. Some portions of the detailed description that follows are presented in terms of algorithms and symbolic representations of operations on data bits or binary digital signals within a computer memory. These algorithmic descriptions and representations may be the techniques used by those skilled in the data processing arts to convey the substance of their work to others skilled in the art. In some embodiments, such algorithms and data processing may include analog processing at baseband frequencies, intermediate-frequencies (IF), or radio-frequencies (RF) implemented at least in part in hardware, in software, or in a combination thereof, although the scope of the invention is not limited in this respect. It should be understood that embodiments of the present invention may be used in a variety of applications. Although the present invention is not limited in this respect, the circuits disclosed herein may be used in many apparatuses such as in the transmitters and receivers of a radio system. Radio systems intended to be included within the scope of the present invention include, by way of example only, wireless local area networks (WLAN) devices and wireless wide area network (WWAN) devices including wireless network interface devices and network interface cards (NICs), base stations, access points (APs), gateways, bridges, hubs, cellular radiotelephone communication systems, satellite communication systems, two-way radio communication systems, oneway pagers, two-way pagers, personal communication systems (PCS), personal computers (PCs), personal digital assistants (PDAs), sensor networks, personal area networks (PANs) and the like, although the scope of the invention is not limited in this respect. Referring now to FIG. 1, a wireless local area network communication system in accordance with one embodiment of the present invention will be discussed. In the WLAN communications system 100 shown in FIG. 1, a mobile unit 110 may include a wireless transceiver 112 to couple to an antenna 118 and to a processor 114 to provide baseband and media access control (MAC) processing functions. Processor 114 in one embodiment may comprise a single processor, or alternatively may comprise a baseband processor and an applications processor, although the scope of the invention is not limited in this respect. Processor 114 may couple to a memory 116 which may include volatile memory such as DRAM, non- volatile memory such as flash memory, or alternatively may include other types of storage such as a hard disk drive, although the scope of the invention is not limited in this respect. Some portion or all of memory 116 may be included on the same integrated circuit as processor 114, or alternatively some portion or all of memory 116 may be disposed on an integrated circuit or other medium, for example a hard disk drive, that is external to the integrated circuit of processor 114, although the scope of the invention is not limited in this respect. Mobile unit 110 may communicate with access point 122 via wireless communication link 132, where access point 122 may include at least one antenna 120. In an alternative embodiment, access point 122 and optionally mobile unit 110 may include two or more antennas, for example to provide a spatial division multiple access (SDMA) system or a multiple input, multiple output (MIMO) system, although the scope of the invention is not limited in this respect. Access point 122 may couple with network 130 so that mobile unit 110 may communicate with network 130, including devices coupled to network 130, by communicating with access point 122 via wireless communication link 132. Network 130 may include a public network such as a telephone network or the Internet, or alternatively network 130 may include a private network such as an intranet, or a combination of a public and a private network, although the scope of the invention is not limited in this respect. Communication between mobile unit 110 and access point 122 may be implemented via a wireless local area network (WLAN), for example a network compliant with a an Institute of Electrical and Electronics Engineers (IEEE) standard such as IEEE 802.1 la, IEEE 802.1 lb, IEEE 802.1 lg, IEEE 802.1 In, HiperLAN-II, and so on, although the scope of the invention is not limited in this respect. In another embodiment, communication between mobile unit 110 and access point 122 may be at least partially implemented via a cellular communication network compliant with a 3 GPP standard, although the scope of the invention is not limited in this respect. In one embodiment of the invention, the MIMO channel may correspond to a single carrier system. For example, in a multicarrier orthogonal frequency division multiplexing (OFDM) system, the channel matrix may correspond to the MIMO channel on one frequency tone, and may be different from tone to tone, although the scope of the invention is not limited in this respect. In general, the channel matrix may be a random variable that may depend on the location of transmitting transceiver 210 and receiving transceiver 216, the placement of antennas 212 to 214 and 218 to 220, the carrier frequency, and the scattering environment around transmitting transceiver 210 and receiving transceiver 216. The channel matrix may vary with time depending on the rate at which the environment is changing or the rate at which transmitting transceiver 210 and receiving transceiver 216 may be moving. In accordance with one embodiment of the present invention, the channel may be reliably estimated at receiving transceiver 216. To obtain channel knowledge at the transmitting transceiver 210, such as in a time division duplex (TDD) systems, the channel matrix H may be determined based on the channel estimated on the reverse link from the receiving transceiver 216 to the transmitting transceiver 210. In a frequency division duplex (FDD) system, the channel from the transmitting transceiver 210 to the receiving transceiver 216 may be highly uncorrelated with the channel in the reverse direction, so active feedback of the channel from the receiving transceiver 216 to the transmitting transceiver 210 may be utilized. Even in a TDD system, if the channel changes during the time between receiving and transmitting, or if the calibration on the transmit and receive radio-frequency (RF) chains is not sufficiently accurate, active feedback of the channel from the receiving transceiver 216 to the transmitting transceiver 210 may be utilized as well. In accordance with one embodiment of the present invention, one of two ways to signal over a MIMO link may be utilized, depending on the degree of channel knowledge available at the transmitting transceiver 210: open-loop signaling where the transmitting transceiver 210 has no knowledge of the channel; and closed loop signaling where the transmitting transceiver 210 may have partial or complete information about the channel matrix H, for example the value of H, or alternatively statistics of H such as the correlation E HH*. In accordance with one embodiment of the invention, both open loop signaling and transmitter-trained signaling techniques may be used to improve signal quality, for example the signal-to-noise ratio (SNR), at the receiving transceiver 216 regardless of the actual channel realization. Either of these techniques may be utilized to increase spectral efficiency as measured in bits per second per hertz, and performance may be a function of the channel realization H. In accordance with one particular embodiment of the invention, depending on the physics of the propagation environment, H may be conditioned to support a higher spectral efficiency. 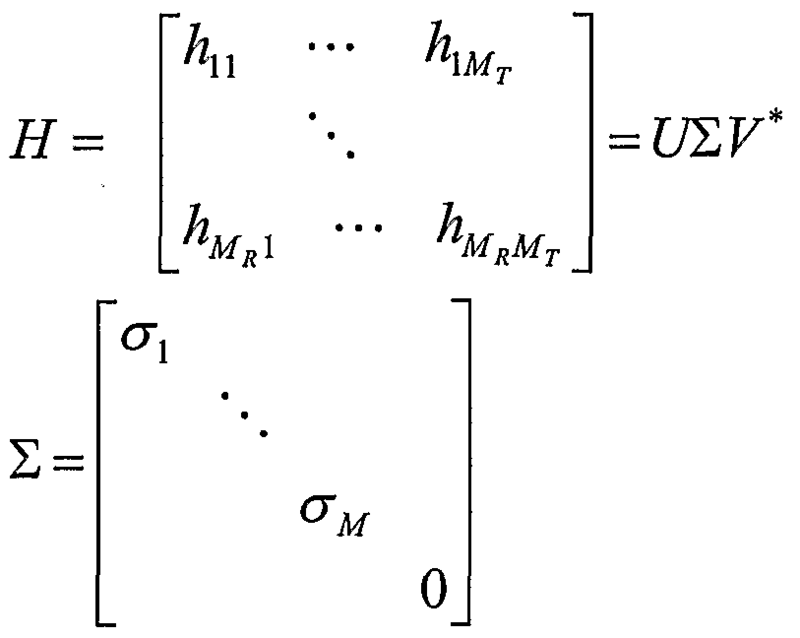 The condition number of H, κ(Η) may be defined using the singular value decomposition of H=U∑V as K = σ] / σ/w , where σi is the strongest singular value and σ^ is the weakest singular value of H and M minimum( , MR) . Both the open-loop and transmitter-trained MIMO techniques may provide optimal performance when K = 1 , that is when most or all the singular values are equal. In the event the singular values are unequal, then K > 1. The larger the value of K , the more ill- conditioned the channel H may be, and the smaller the improvement in spectral efficiency provided by the MR X Mγ point-to-point MIMO link. Since different receiving transceivers 312 to 314 may be located at different physical locations, the channels of transceivers 312 to 314 are likely to be highly uncorrelated. As in MIMO system 200, these U channels may correspond to a single carrier system, and may be interpreted for example as the channels on a single tone of an OFDM system, although the scope of the invention is not limited in this respect. Furthermore, although the SDMA system 300 of FIG. 3 shows MR receive antennas on the transceivers 312 to 314, the number of receive antennas may vary from user 312 to user 314, although the scope of the invention is not limited in this respect. In such a case, MR may be interpreted as a maximum, or near maximum, number of receive antennas on the receivers 312 to 314, although the scope of the invention is not limited in this respect. H = [Hx Hv] For comparison to SDMA link 316, MIMO link 222 as shown in FIG. 2 may be interpreted in one case as a point-to-multipoint link where data may be concurrently encoded over multiple transmit antennas and concurrently decoded at multiple receive antennas, and may be considered as corresponding to virtual multiple SDMA users, and as a result may provide a higher spectral efficiency over the MIMO link, although the scope of the invention is not limited in this respect. Taking into consideration the MAC layer traffic characteristics, a network with SDMA link 316 in one embodiment may outperform a network with independent MIMO links 222 in terms of aggregate throughput. Such a result may be especially appreciable in network hot-spots, where multiple MIMO users may encounter frequent collisions before they are able to access the carrier sense multiple access (CSMA) medium. As a result of such collisions, users may have to use random back off and wait before transmitting again, which may increase the latency per packet. In contrast, SDMA users may be served simultaneously without increasing the probability of collision, thereby resulting in higher network throughput and lower latency, although the scope of the invention is not limited in this respect. Referring now to FIG. 4, a flow diagram of a method for adaptive signaling over multiple antennas by switching between a multiple input, multiple output mode and a spatial division, multiple access mode in accordance with an embodiment of the invention will be discussed. As shown in FIG. 4, method 400 may be utilized in a wireless local area network system such as WLAN system 100 of FIG. 1 to allow WLAN system 100 to switch between a MIMO mode and an SDMA mode. In one embodiment of the invention, when method 400 switches to a MIMO mode, MIMO operation may be performed using open-loop signaling although the scope of the invention is not limited in this respect. In an alternative embodiment, either one or both MIMO and SDMA operation may be performed using closed-loop signaling, for example when the channel is stationary or nearly stationary, although the scope of the invention is not limited in this respect. In one embodiment of the invention, method 400 may be executed by access point 122 of FIG. 1, for example as instructions executed by baseband processor 126 and stored in memory 128, although the scope of the invention is not limited in this respect. In such an embodiment, access point 122 may function as transmitting transceiver 210 of FIG. 2 while operating in a MIMO mode, and may function as transmitting transceiver 310 of FIG. 3 while operating in an SDMA mode, although the scope of the invention is not limited in this respect. At block 410, access point 122 may estimate and store the MIMO channel matrices of up to U receivers. A determination may be made at block 412 whether to operate in a MIMO mode or in an SDMA mode. In the event most of the U channels are ill-conditioned, method 400 may proceed along branch 414 to block 416 where operation may occur using point-to-multipoint SDMA to the U users concurrently. While operating in an SDMA mode, at block 418 access point 122 may observe the performance of the PHY layer at the receivers 312 to 314, and the MAC layer at transmitting transceiver 310. A determination may be made at block 420 whether to continue in an SDMA mode or to switch to a MIMO mode, based on the performance of the PHY and MAC layers observed at block 418. In one embodiment of the invention, good performance of the PHY layer may be defined as operating at a higher data rate, at a higher signal-to-noise ratio (SNR), at a lower bit error rate (BER), and at a higher spectral efficiency, although the scope of the invention is not limited in this respect. In one embodiment of the invention, good performance of the MAC layer may be defined as operating with a lower latency and at higher throughput with relatively few retransmits, although the scope of the invention is not limited in this respect. In the event of good PHY layer and MAC layer performance, method 400 may continue along branch 422 and continue to operate in an SDMA mode at block 416, although the scope of the invention is not limited in this respect. In the event of poor PHY performance, for example in the event of a lower spectral efficiency per user, method 400 may switch from an SDMA mode to a MIMO mode by executing along branch 424. Such a switch from an SDMA mode to a MIMO mode may occur even where the performance of the MAC layer may be considered good, although the scope of the invention is not limited in this respect. In an alternative embodiment, one or more of receivers 312 to 314 may require a higher throughput than others, for example a receiver may require a higher quality of service (QoS), which may be provided by serving fewer simultaneous users at higher spectral efficiencies per user. In such a case, method 400 may switch from an SDMA mode to a MIMO mode by executing along branch 424 to operate in a MIMO mode at block 428, although the scope of the invention is not limited in this respect. In the event at block 412 it is determined that most of the U channels are well conditioned, then method 400 may execute in a point-to-point MIMO mode at block 428 in which transmitting transceiver 210 may communicate with one receiving transceiver 216 at a time. While operating in a MIMO mode, the PHY layer performance of the receiving transceivers 216 and the MAC layer performance of the transmitting transceiver 210 may be observed at block 430. A determination may be made at block 432 whether to continue in a MIMO mode or to switch to an SDMA mode. If the PHY layer performance and the MAC layer performance are good, then method 400 may execute along branch 434 and continue operating in a MIMO mode at block 428, although the scope of the invention is not limited in this respect. In the event the MAC layer performance is poor, for example where there is a higher number of receiving transceivers resulting in a higher number of collisions, then method 400 may switch from a MIMO mode to an SDMA mode by executing along branch 436 to operate in an SDMA mode at block 416. Such a switch from a MIMO mode to an SDMA mode may occur even where the performance of the PHY is good, although the scope of the invention is not limited in this respect. In accordance with one embodiment of the invention, method 400 may adapt WLAN system 100 to provide a higher aggregate network throughput and a lower average latency in response to channel conditions and traffic conditions, although the scope of the invention is not limited in this respect. In one embodiment of the invention, while operating in a MIMO mode, channel conditions may occur where signal quality may be improved, but spectral efficiency may not be improved. In such a case, it may not be efficient to use all of the transmit antennas 212 to 214 for one MIMO receiving transceiver 216 at a time, and as a result it may be more efficient to serve multiple users simultaneously. In such a case, method 400 may switch from a MIMO mode to an SDMA mode by executing along branch 436 to operate in an SDMA mode at block 416, although the scope of the invention is not limited in this respect. In accordance with one embodiment of the invention, while executing the method 400 as shown, WLAN system 100 may obtain updated channel estimates over time. Such updated channel estimates may be obtained to accommodate for changes in the physical environment, for example from movement of the users or from additional users entering or leaving the environment of WLAN system 100, that may affect the performance of the PHY layer. Such changes in the physical environment may affect the observations made at block 418 and at block 430 so that method 400 may switch between a MIMO mode and an SDMA mode in accordance with changes in the channel, although the scope of the invention is not limited in this respect. In one embodiment of the invention, point-to-point operation in a MIMO mode and point-to-multipoint operation in an SDMA mode as embodied by method 400 may analogously extend to higher bandwidth channels as well in accordance with the present invention. For example, a point-to-point higher bandwidth channel system may serve one user at a time at a higher bandwidth, whereas a point-to-multipoint higher bandwidth channel system may serve multiple lower channel users at a time at lower bandwidths for the users. In accordance with the present invention, adaptation between point-to-point channel bonding systems and point-to-multipoint channel bonding systems may be performed in a manner substantially similar as method 400, although the scope of the invention is not limited in this respect. Although the invention has been described with a certain degree of particularity, it should be recognized that elements thereof may be altered by persons skilled in the art without departing from the spirit and scope of the invention. It is believed that the adaptive signaling in multiple antenna systems of the present invention and many of its attendant advantages will be understood by the forgoing description, and it will be apparent that various changes may be made in the form, construction and arrangement of the components thereof without departing from the scope and spirit of the invention or without sacrificing all of its material advantages, the form herein before described being merely an explanatory embodiment thereof, and further without providing substantial change thereto. It is the intention of the claims to encompass and include such changes. 1. A method, comprising: operating in a multiple input, multiple output mode; and in the event of a predetermined condition, operating in a spatial division, multiple access mode. 2. A method as claimed in claim 1, wherein the predetermined condition includes a latency value exceeding a predetermined value. 3. A method as claimed in claim 1, wherein the predetermined condition includes a throughput value being below a predetermined value. 4. A method as claimed in claim 1, wherein the predetermined condition includes a number of collisions exceeding a predetermined value. 5. A method as claimed in claim 1, wherein the predetermined condition includes a desired higher spectral efficiency. 6. A method as claimed in claim 1, wherein the predetermined condition includes a number of receivers exceeding a predetermined value. 7. A method, comprising: operating in a spatial division, multiple access mode; and in the event of a predetermined condition, operating in a multiple input, multiple output mode. 8. A method as claimed in claim 5, wherein the predetermined condition includes a spectral efficiency per user being below a predetermined value. 9. A method as claimed in claim 5, wherein the predetermined condition includes a data rate being below a predetermined value. 10. A method as claimed in claim 5, wherein the predetermined condition includes a desired higher data rate for at least one user. 11. A method as claimed in claim 5, wherein the predetermined condition includes a desired higher quality of service for at least one user. 12. A method, comprising: estimating a channel matrix for at least one or more receivers; in the event the channels are well-conditioned, operating in a multiple input, multiple output mode; and otherwise operating in a spatial division, multiple access mode. 13. A method as claimed in claim 12, further comprising, while operating in a multiple input, multiple output mode, observing a media access layer performance at transmitter, and in the event of poor media access layer performance, switching to a spatial division, multiple access mode. 14. A method as claimed in claim 12, further comprising, while operating in a spatial division, multiple access mode, observing physical layer performance of the at least one or more receivers, and in the event of poor physical layer performance, switching to a multiple input, multiple output mode. 15. An article, comprising: a storage medium having stored thereon instructions that, when executed by a computing platform, result in adaptive switching between a multiple input, multiple output mode and a spatial division, multiple access mode by: operating in a multiple input, multiple output mode; and in the event of a predetermined condition, operating in a spatial division, multiple access mode. 16. An article as claimed in claim 15, wherein the predetermined condition includes a latency value exceeding a predetermined value. 17. An article as claimed in claim 15, wherein the predetermined condition includes a throughput value being below a predetermined value. 18. An article as claimed in claim 15, wherein the predetermined condition includes a number of collisions exceeding a predetermined value. 19. An article as claimed in claim 15, wherein the predetermined condition includes a desired higher spectral efficiency. 20. An article as claimed in claim 15, wherein the predetermined condition includes a number of receivers exceeding a predetermined value. 21. An article, comprising: a storage medium having stored thereon instructions that, when executed by a computing platform, result in adaptive switching between a multiple input, multiple output mode and a spatial division, multiple access mode by: operating in a spatial division, multiple access mode; and in the event of a predetermined condition, operating in a multiple input, multiple output mode. 22. An article as claimed in claim 21, wherein the predetermined condition includes a spectral efficiency per user being below a predetermined value. 23. An article as claimed in claim 21, wherein the predetermined condition includes a data rate being below a predetermined value. 24. An article as claimed in claim 21, wherein the predetermined condition includes a desired higher data rate for at least one user. 25. An article as claimed in claim 21, wherein the predetermined condition includes a desired higher quality of service for at least one user. 26. An article, comprising: a storage medium having stored thereon instructions that, when executed by a computing platform, result in adaptive switching between a multiple input, multiple output mode and a spatial division, multiple access mode by: estimating a channel matrix for at least one or more receivers; in the event the channels are well-conditioned, operating in a multiple input, multiple output mode; and otherwise operating in a spatial division, multiple access mode. 27. An article as claimed in claim 26, wherein the instructions, when executed, further result in adaptive switching between a multiple input, multiple output mode and a spatial division, multiple access mode by, while operating in a multiple input, multiple output mode, observing a media access layer performance at transmitter, and in the event of poor media access layer performance, switching to a spatial division, multiple access mode. 28. . A method as claimed in claim 27, wherein the instructions, when executed, further result in adaptive switching between a multiple input, multiple output mode and a spatial division, multiple access mode by, while operating in a spatial division, multiple access mode, observing physical layer performance of the at least one or more receivers, and in the event of poor physical layer performance, switching to a multiple input, multiple output mode. 29. An apparatus, comprising: a transceiver; at least two or more omnidirectional antennas to couple to said transceiver; and a baseband processor to couple to said transceiver, wherein said baseband processor and said transceiver switch from a multiple input, multiple output mode to a spatial division, multiple access mode under a first condition, and switch from a spatial division, multiple access mode to a multiple input, multiple output mode under a second condition. 30. An apparatus as claimed in claim 29, wherein the first condition includes at least one of a higher latency, a lower throughput, a higher number of retransmits, and a higher number of receivers . 31. An apparatus as claimed in claim 29, wherein the second condition includes at least one of a lower signal-to-noise ratio, a higher bit error rate, a lower spectral efficiency, a desired higher data rate for at least one receiver, a desired higher quality of service for at least one receiver, and a lower number of receivers.